After a year of challenges and changes in the gorilla unit, we have much to celebrate this month. The first is the return of 39-year-old male, Vip, to the East gorilla exhibit, along with 33-year-old female, Jumoke. Vip, who is the father of seven daughters, including our own 17-year-old Akenji, 10-year-old Uzumma and nearly 3-year-old Yola, has been off view for more than a year now—since June of 2017. That’s when he underwent a lifesaving surgery due to an infection within a long-established umbilical hernia. 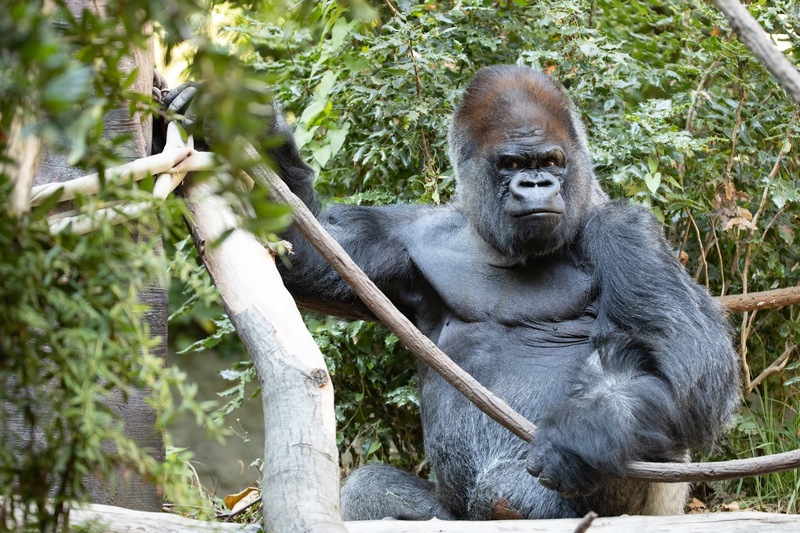 Vip was born with this hernia in 1979, and it had remained stable since he came to Woodland Park Zoo in 1996. In the summer of 2017, his care team noticed a subtle change in the size and appearance of Vip’s umbilical hernia along with changes in his behavior and appetite. Shortly thereafter, an ultrasound revealed a life-threatening infection at the hernia site and it was decided that Vip needed emergency surgery to save his life. 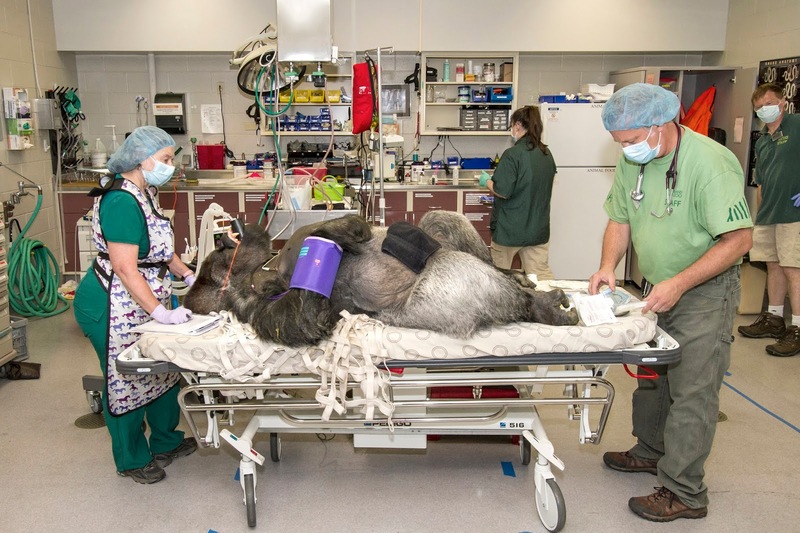 The veterinary staff was standing by, along with a surgical team from the University of Washington Medical Center. They successfully removed all the infected tissue from the hernia area, and fortified the site before closing it, using the kind of surgical mesh that would be used on humans. The mesh used was temporary—to help hold the edges of the incision site together as it healed before being absorbed by the body. Vip was back in the unit later that afternoon, but with strict doctor’s orders to be kept separate from his family, Jumoke and Uzumma, until his surgical site was better healed and would be less compromised in a group setting. For the most part, all of them handled this well. Vip was given access to a separate room next to the females, where he could rest while still having the comforts of visual, auditory and olfactory access to his family. With the doors kept ajar to a “peek-a-boo” width (faces can look and see, but bodies cannot get through), Vip recovered slowly and surely. His hernia wound was shrinking and granulating—a sign that the tissue along the edges was healing. His care team could anticipate the whole wound closing eventually. Unfortunately, by September of 2017, the team began to notice that the perimeter of Vip’s surgical site was no longer shrinking. It was expanding. We knew that the mesh used was supposed to be absorbed by the body over time, but due to a silverback’s weight—Vip weighed 439 pounds at the time of surgery—and the way that weight puts stress on their abdominal area when sitting and walking, Vip’s mesh began to break down and be absorbed before the surgical site had sufficient time to completely heal. This resulted in an area on his lower abdomen that looked like an open, yet superficial wound. Over the past year, the hernia area has been reassessed by veterinary staff and consultants, and despite how the surgical site looks from the outside, that team tells us that everything seems healthy on the inside. That means Vip has finally been given the green light to return to a more normal routine. Currently he is managing well and his condition is not interfering with his activities, which include access to Jumoke and having full access to his exhibit. His mobility, behavior and normal appetite are all positive indicators of his overall comfort—and they are markers we will continue to monitor and measure throughout his life. 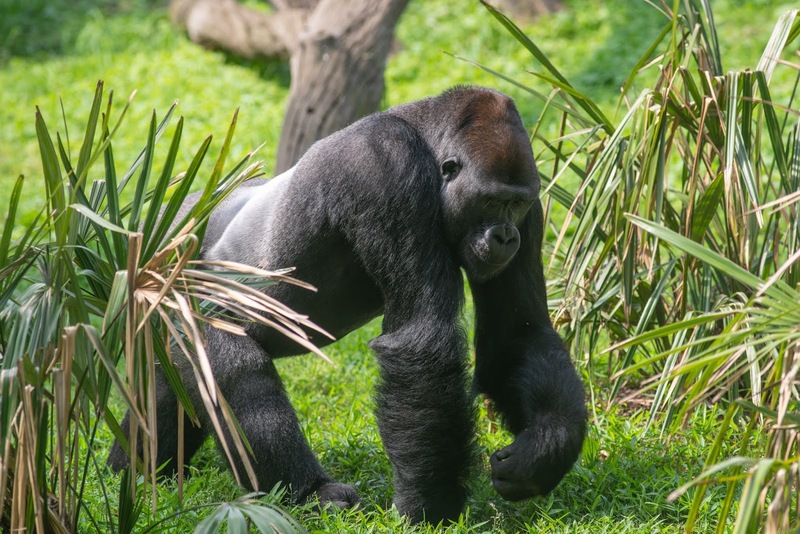 In addition to twice weekly laser therapies for age-related arthritis—at 39, Vip is already several years older than the median life expectancy for wild male western lowland gorillas—he now also participates in twice daily topical treatments on his hernia site, which helps protect him from infections. We also document the appearance of his wound, sending comparative photos to vet staff every day, who then share them with consultants from the original surgical team. Another important step in monitoring Vip’s health is that he now partakes in voluntary ultrasounds that we can administer while he’s awake. Training with our animals and maintaining a bond of trust like this means we will be able to consistently monitor the healing of Vip’s hernia site without having to anesthetize him. Going forward, the information we are able to gather with his help will be valuable in terms of this ongoing health issue and any others that may arise. As you reacquaint yourself with Vip and Jumoke in the East exhibit, we will be busy acquainting Nadiri, Akenji and Yola to Uzumma, who will be moving over to their group. Soon, all of these females will be introduced to their new silverback, Kwame, who arrived September 6th. Yet another reason to celebrate! Once the new family group is established and comfortable with one another, Kwame’s group will be on view in the East exhibit, alternating their time with Vip and Jumoke. We’ll share more about Kwame and his group later. For now, be sure to stop by and visit with Vip and Jumoke in the East exhibit. It’s been awhile since they’ve had visitors and we know they’d love to see you! 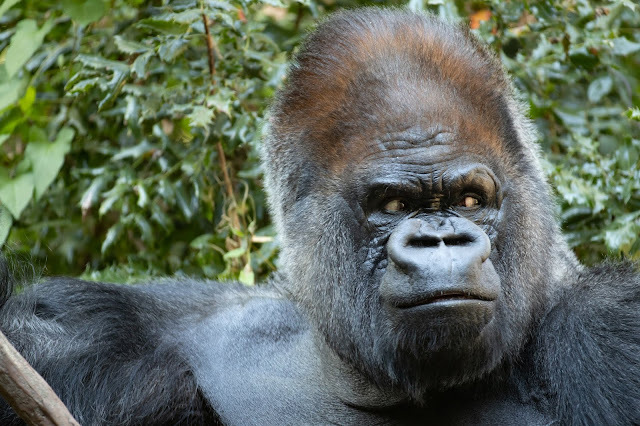 While we already miss seeing Kwame at @Smithsonian's National Zoo, we know everyone at @WoodlandPark will love him. He is one very handsome guy!